A rickshaw is a two-wheel or three-wheel vehicle used for carrying passengers. One of the most acceptable theories about the invention of rickshaw believes that an American missionary invented it in order to carry his invalid wife. During the French colonial time, rickshaw, or more specifically, cyclo appeared in Vietnam and became a popular transportation means. However, this unique vehicle now serves mainly as a tourist attraction. Unlike the two-wheel one pulled by man on foot, the rickshaws in Vietnam nowadays are powered by a man pedaling behind, with two of the wheels in the front and one in the back under the driver. 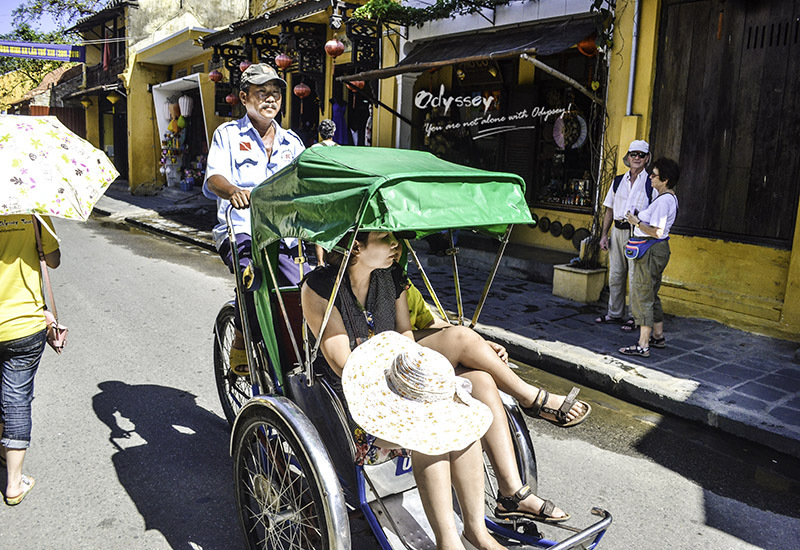 It's really an authentic way to explore the Vietnamese cities by rickshaw, which you can experience the local civil life, and the drivers are usually very passionate about telling you the stories and cultures of Vietnam. 1.  For a better experience, we recommend that a rickshaw carries one person for a time. 2. It's always wise to negotiate the charges before you jump into the cabin, in order to avoid unnecessary argument. One trick about bargaining with the drivers is that you can first offer a third of the price, and then haggle the fare to about half of the price. If the driver still refuses it, you can try pretending to walk away for seeking another driver, and then there's a great possibility that he will accept the deal. 3. A rickshaw exploration to Hanoi's Old Quarter is recommended, which you can get a close touch to the local Vietnamese life. As the "rice bowl of Vietnam", the Mekong Delta's fertilization has breeding a gorgeous "water civilization". 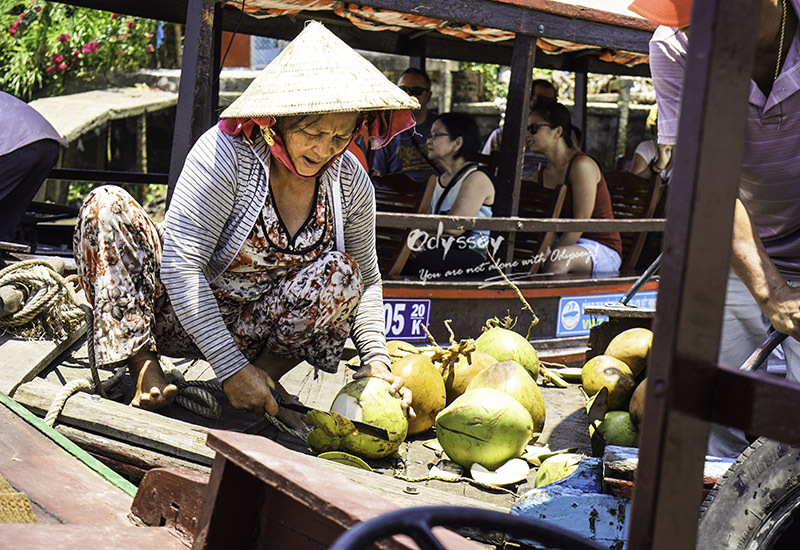 The local floating markets make up one of the special Vietnamese cultures. 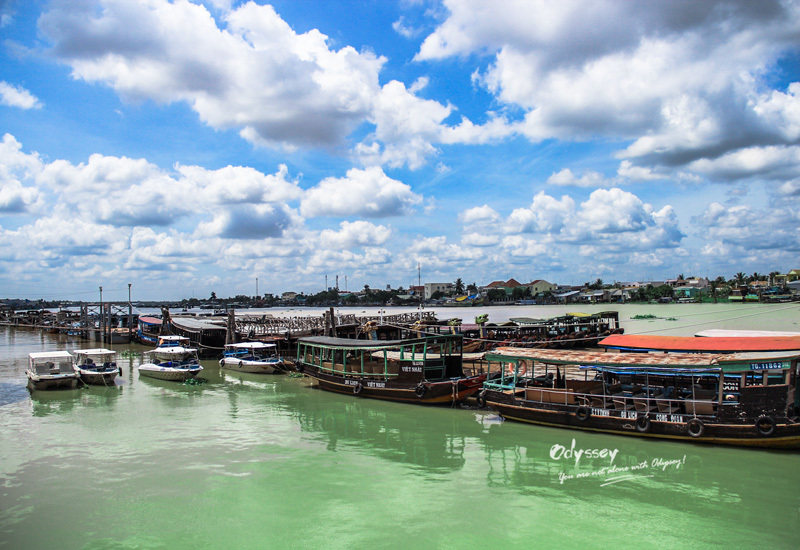 It is said that the floating markets date back to the 19th century, during the reign of Nguyen Dynasty. One of the special characteristics of floating markets is the produce samples hung on a lateral bar to help buyers know what the traders are selling. With traders carrying their fresh goods by boats and doing the bargains on the water, the hustle and bustle of this unique scene has gained its popularity among travelers. Can Tho - Cai Rang market: a must-see floating market when traveling to Can Tho, and it's a big wholesale market, where you can find large quantities of fresh fruits being sold in this busy region. And the typical breakfast of the local area consists of rice noodles and soup sold on boats. It would be an authentic Vietnamese experience to taste the simon-pure cuisine while enjoying the floating feeling. Start time：5am, get crowded at 6 am, so make sure you get up early enough to catch the busy scene. Tien Giang – Cai Be market: just a short distance from Ho Chi Minh City, so it is quite convenient for foreign travelers to pay for a visit. This floating market also sees the trade of fruits and vegetables as well as seafood, and it starts not as early as other floating markets. It starts at the moment of sunrise and lasts until late morning. During the lunar months from December 27/28 to January 6, the floating markets are usually closed, when Vietnamese are on their celebration of the Vietnamese New Year. 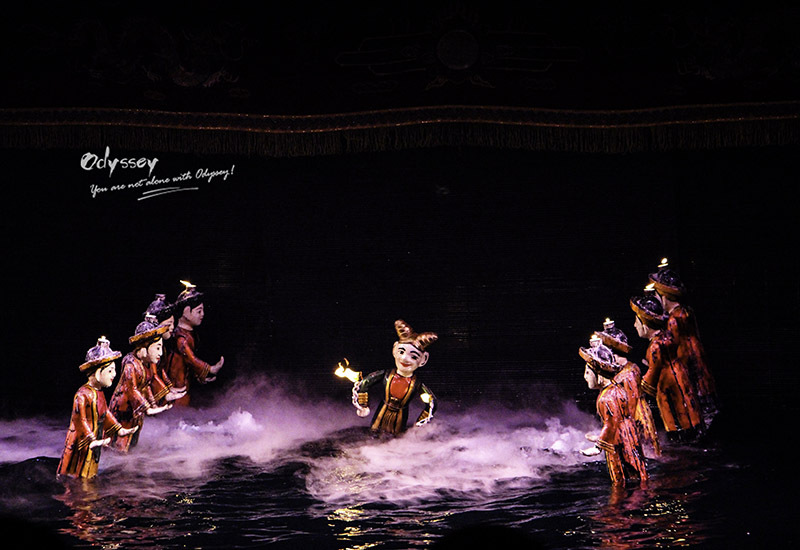 The stories of the puppet show are usually about people's daily lives, legends, and some historical heroes. And the background music is played live with story-telling singing, drums, pipes, and other traditional instruments. It's a great cultural learning time to share with families. Silk painting was originally a traditional art form of painting on the homemade rice paper, and later Nguyen Phan Chanh created the style of painting on silk that we see today. The elegance of this art soon became popular among the country for the softness and vibrant colors. Artists will directly use the silk canvas as the background and then paint with watercolor, dye or ink. The beauty of a silk painting largely depends on the silk quality and the colors that chosen, and you will not get the chance to erase it if you paint a wrong stroke of the brush on the silk. Just like the material that used, the silk paintings present a soft status with simple subjects and gentle painting style. They usually portray the countryside lives and beautiful natural landscapes. After developing for a long time, the Vietnamese silk paintings are now attracting both domestic and foreign fans to admire this unique art. Banh Chung is one of the special traditional foods that people would make during the Vietnamese New Year. It is usually made of sticky rice, along with pork meat and green bean, all wrapped in the shape of a perfect square with a leaf of a certain local plant called Dong. And then Vietnamese would place the Banh Chung and other foods on the ancestors' altars (ancestor worship) till cook them on one or two days before the New Year. 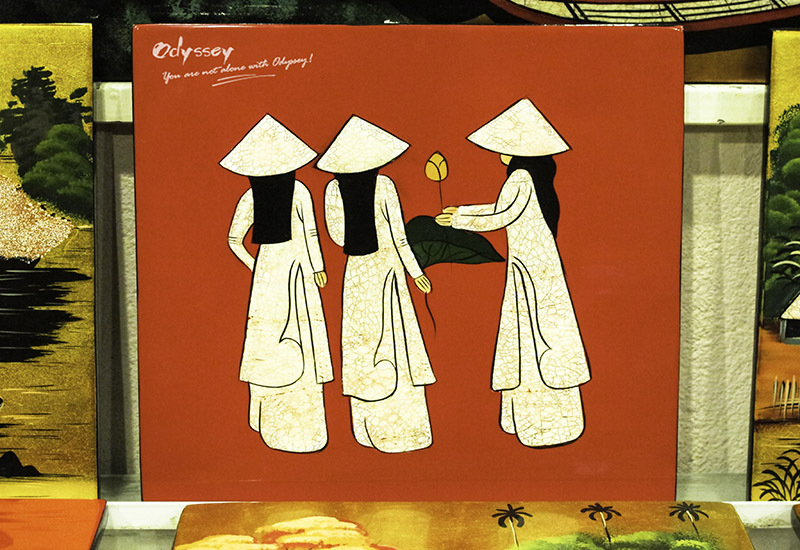 Though much Chinese influence is seen among different Vietnamese cultures, the history of Vietnam tells us that Vietnamese cultures have been mixing with many other cultures as time went by. If your enthusiasm for a trip to Vietnam has been aroused, then stop hesitating and contact our professional travel consultants at . We will respond to your inquiry within 24 hours and tailor-make your private itinerary for you.